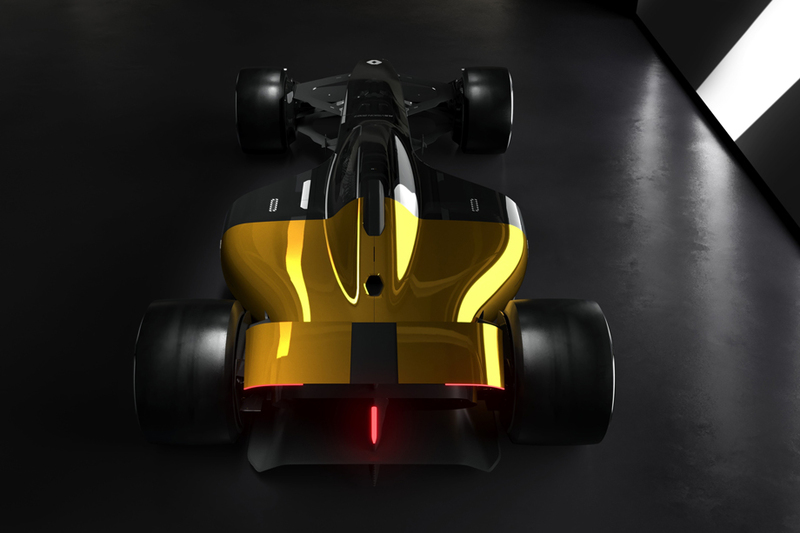 Renault is celebrating 40 years of participation in Formula One racing by looking to the future. 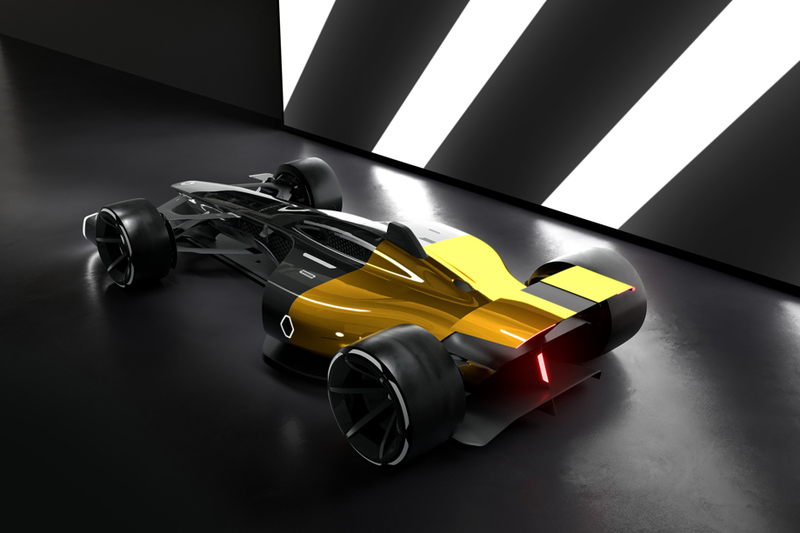 The automaker unveiled a future-looking idea of what F1 racecars might evolve to in 10-years time. The Renault R.S. 2027 Vision aims to explore technology advancements, driver safety improvements and provides a better show for spectators. The R.S. 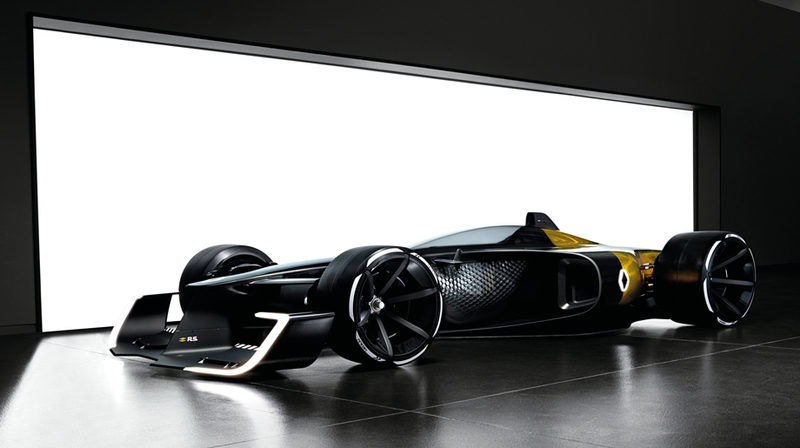 2027 Vision is still recognizable as an F1 race car, featuring a single seat and open wheel configuration, but everything beyond that is totally different. 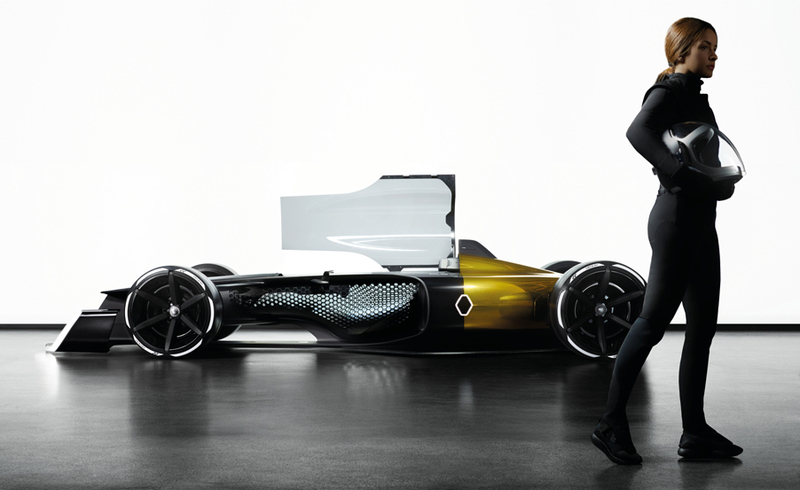 The car is designed around the driver and creating a closer connection between them and the fans. The driver’s cockpit is envisioned to be a 3D-printed honeycomb structure that is form-fitted to the driver’s unique body shape. 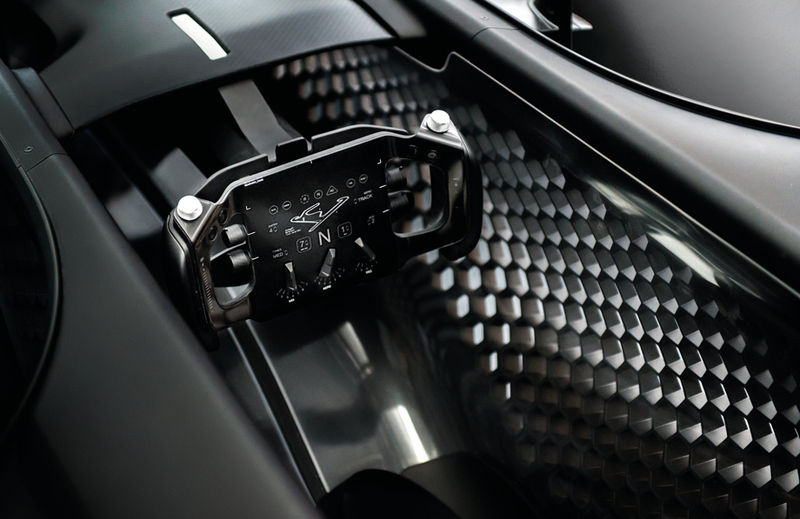 It is covered with a transparent polycarbonate shell giving spectators a better view of the driver inside the car. Autonomous driving could be more common in ten years’ time and the R.S. 2027 Vision makes use of that technology. The car would fully take over driving during safety periods and in yellow flag areas. In the pit lane, the car’s speed would be automatically reduced, giving the driver one less thing to worry about. New vehicle-to-vehicle communications systems would provide the driver with realtime updates about the location of competitors and their proximity. In the pit lane, the car would monitor other traffic and only exit when a safe distance was available. The exterior incorporates a transparent canopy over the cockpit. The idea is to improve driver safety and prevent injuries from flying debris. 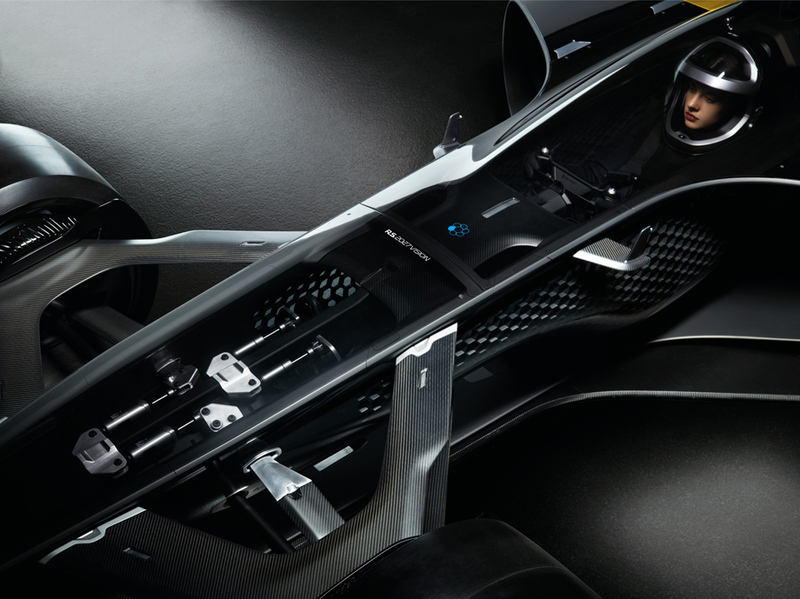 The canopy is framed by two titanium roll bars that extend up within milliseconds of the car starting to overturn. The bars allow space for the driver to escape between the car and the ground should it come to rest upside down. The R.S. 2027 Vision incorporates a number of lighting elements designed to provide information to spectators. Light strips on the front wings change color from white to blue to signal when the hybrid V6 power plant switches to full electric mode. The front wheels incorporate a LED projector system that displays a lap counter or race position. 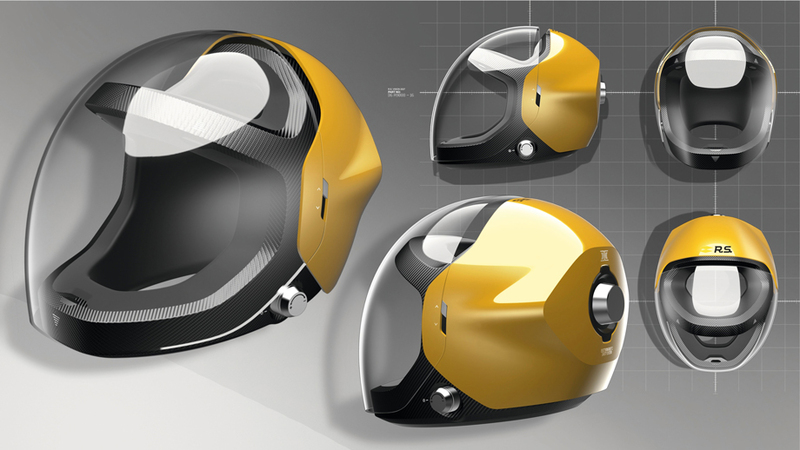 Beyond the car, Renault designers looked at ways to improve driver visibility and fans’ view of them through their helmets. The proposed design has a broader transparent area made of high impact plastic. The open design would allow cameras to better capture driver’s expressions while they are competing. A controversial issue of the sport today is aerodynamics and the effect they have on making passing more difficult. The R.S. 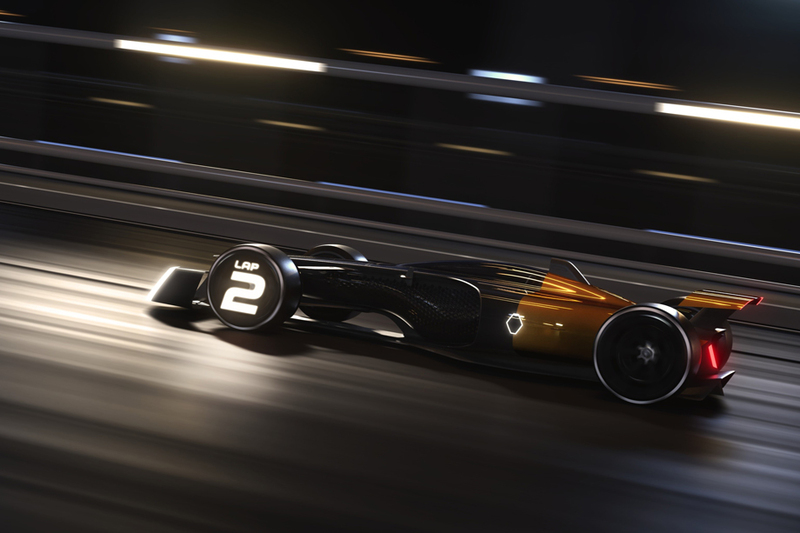 2027 Vision incorporates active aerodynamic elements like the rear wing which could give competitors added options to alter their car’s performance to better chase down the leaders.